In many walks of life, the ‘Goldilocks ratio’ is of primary importance. Just enough salt; not too much sugar; a good beach tan without being sunburnt. From the kitchen to the ocean, finding balance is an important thing. At Lucky Labrador Brewing Company, Alex Stiles and Gary Geist have struck a great balance not only in the beer hall, but in the brewing tanks as well. Walking into their original brewpub on Hawthorne Boulevard in Southeast Portland—a converted warehouse that used to house roofing tiles and ladders—one finds such a sense of balance. Even though Lucky Labrador has been brewing beer in this space for more than two decades, the brewpub somehow feels newly converted, retaining a certain gritty charm that only former warehouses can offer. But again, there’s that balance: a rustic warehouse space, but flooded by skylight sun, it’s gritty without grime. Not lazy—lazy brewers don’t make beer this good—but certainly laid-back. And that’s precisely what Alex and Gary wanted: a brewpub with great beer, but without pretension. Having worked in the 9-to-5 workaday world, both Alex Stiles and Gary Geist were keen to leave stuffiness and pretense behind along with the cubicle when they set out to open their brewpub back in 1994. Having worked in finance, and even balanced the books for the opening of a brewery, Geist had a leg up on the business end, while Stiles’ two years at Bridgeport Brewing Company meant he was no stranger to mash tuns and brew kettles. With knowhow both in ledgers and malt, dry-hopping and number crunching, the two childhood friends were ready to make their oft-discussed dream a reality. They just needed one thing: a name. When I spoke to Alex at their original Hawthorne location, he told me that their initial plan was to name the brewpub “Lucky Dog Brewing.” “We thought, well, if we can pull this off and be successful, we’ll be really lucky dogs.” The name, however, was taken by a company that sold food for dogs, not beers for humans. They decided to keep the basic template, and just get a bit more specific. 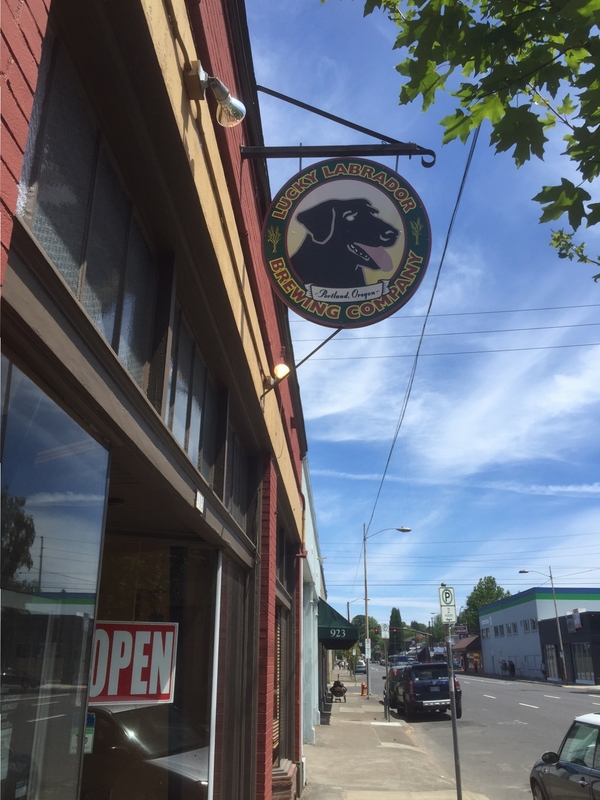 “Gary’s had labrador’s all his life,” Alex said, and thus Lucky Labrador Brewing was born. After my chat with Alex, surrounded in the back by the brewing equipment used to brew up Lucky Lab’s beer, we walked around to the bar area up front, and he poured me a couple paddles of beer samples, twelve small glasses in all. “That’ll keep ya busy for a while,” he said with a grin, walking back to brew up the next batch. I grabbed my sample glass of No Pity Ale—a beer brewed in honor of the Portland Timbers Football Club and their fans, famous for chanting “There’s No Pity in the Rose City”—and got up to walk around what once was a warehouse, now a staple in the Portland beer scene. There’s something eclectic about the decor of Lucky Labrador’s original location, but it’s not the sort of cloying clutter that’s strategically placed around an Applebee’s. No, this space is filled with the evidence of a longstanding, well-loved community pub. From the upright piano to the stained glass incarnation of Lucky Labrador’s logo, this Hawthorne brewpub has enough character to match the quality of its pints. There’s even a huge mural along the back wall, a remarkable recreation of Andrew Wyeth’s famous painting Christina’s World, with one notable difference: staring off into the distance alongside her is a black labrador. After admiring the pub for a bit, I polish of my ale, reach back for another glass—a Maibock this time—and step through the back doors and out onto the patio. 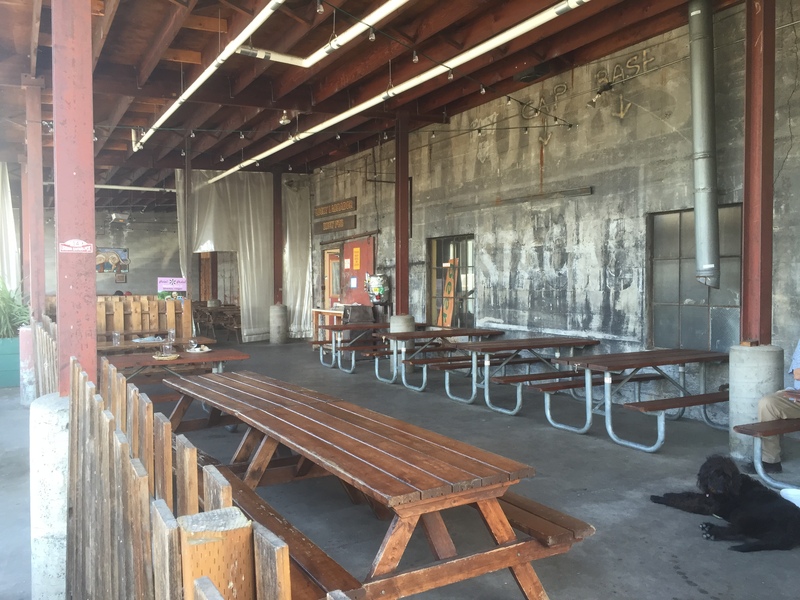 Although, as with the interior, it’s not hard to imagine this space in its former life, as a loading dock for roofing supplies, this patio has become famous in Portland among beer-loving dog-owners. It’s the middle of the week, and only a few patrons are out enjoying beer in the fresh air, but there are still a few dogs hanging out and about on the concrete, beside the rows of picnic tables. And if it’s easy to think of what this space was like during its roofing warehouse days, now more than twenty years past, it’s even easier to imagine it on a warm summer Saturday, packed with people, pooches, and pints—a dog-lovers Oktoberfest in America’s Pacific Northwest. The Maibock I enjoyed out on Lucky Labrador’s patio is brewed perfectly to style, a light but malty beverage designed in Deutschland for the month of May. Although the Hallertau hops come through slightly in the finish, it’s only just enough to balance the beer, as the pale malts are the hero here, not the hops. Remarkably drinkable while still 6.9% alcohol, this one could sneak up on you, but hey, a beer meant to celebrate the end of winter ought to have some chops, right? Although this is another German-born beer style from Lucky Labrador, Crazy Ludwig’s Alt is not the straightforward incarnation of a classic—as is the Maibock—but rather a Northwest remix of an old standard. This altbier, a style originating in Dusseldorf, pours a nice clear amber, and has a pleasing reddish color that is somewhat lighter than the deep brown found in some alts. The malt, a combination of crystal, Munich, and chocolate, sure is present on the palate in this brew, as it ought to be in a German alt beer—but lookout Ludwig, Deutschland’s got some Pacific Northwest hops bringing up the rear. The combination of centennial and cascade give this altbier a stronger hop presence than any other I’ve come across, and that amped up quality is an interesting spin on alt bier’s bigger brother, the so-called “Sticke Altbier” which is traditionally a bit stronger, a bit darker (Ludwig’s not so much there), and also more hoppy than the normal alt. With all the qualities of a proper German alt, combined with a distinctive Pacific Northwest hop finish, this is beer globalization at its finest. In 2014, Lucky Labrador Brewing Company celebrated their 20th Anniversary, and in honor of that occasion, they baked a cake. No, of course they didn’t (although they might have had a slice or two as well); they brewed a new IPA. Clocking in at more than 90 IBU’s, this is a hop fiend’s dream. In addition to the famous Cascade hop, the 20th Anniversary IPA is also dry-hopped with glacier, a hop varietal first developed and bred by Dr. Stephen Kenny at Washington State University in 2000. I asked Alex what he’s been brewing lately, and although he said there’s no single recipe he prefers brewing over another, he confirmed that he’s been really loving the glacier hop recently. This is because it can be both a bittering and an aroma hop, and because, in addition to the pine qualities, “it has a lot of fruity notes as well.” And Alex is, unsurprisingly, spot on: if you get the chance to try Lucky Labrador’s 20th Anniversary IPA expect a truckload of grapefruit tang and orange zest in the finish. If you ever have a friend ask you, “Hey, what does a Rye beer taste like?” point them to this brew from Lucky Labrador. Sure, there are other rye beers that are fantastic, and many of those have a great deal of hops (Founder’s Red Rye IPA comes to mind). But if you want to really get a sense of what the rye flavor brings to a beer, then you need to turn down the hops, amp up the malt, and see what comes through, and this beer does just that. With very little hop presence, the malts—and especially the rye malt—come through loud and clear. If you’re looking for an IPA with some rye to it, this is not for you; if you’re looking to taste that rye malt, then this is your dog. Alex Stiles and Gary Geist have collaborated to create several dozen fantastic beers—but that’s not all. In Lucky Labrador’s brewpub, they’ve also created a great community space, a comfy spot to sit down with friends and enjoy a pint. Luck Lab’s patio and pub are simultaneously reminiscent of the longstanding local English pub, and the great beer gardens of Munich. But however grandiose the fame of drinking establishments evoked by Lucky Labrador, the air there is anything but stuffy, the people entirely without pretense. Don’t misunderstand me: I have nothing against fancy cocktails and posh nosh. Certainly, there’s a time and a place for charcuterie, 33-botanical gin, and rosemary shrub—and then, there’s a time to sit down in the sun, with a dog by your feet, and enjoy a simple sandwich and a pint of fine beer. And when that time comes, there’s also a place: Lucky Labrador Brewing Company.